I have uploaded a couple of Unitron Video Tours. One is an overview of the 3 inch Unitron 145C. This scope is more properly called a “Frankentron” because it was assembled from various Unitron and shop-made components, like a sort of astronomical Frankenstein Monster. I included some nice closeup views of the beautiful setting circles. Please check it out at http://www.youtube.com/watch?v=-UU8zxAxss0 . The second tour is the 4 inch Unitron 160. There are more views of the spectacular Weight Driven Clock drive as well as a brief tour of the entire system. See this at http://www.youtube.com/watch?v=f4-EvkX7D1s. There is also an amusing time-lapse of the assembly of this telescope at http://www.youtube.com/watch?v=izGbmA_73jc . 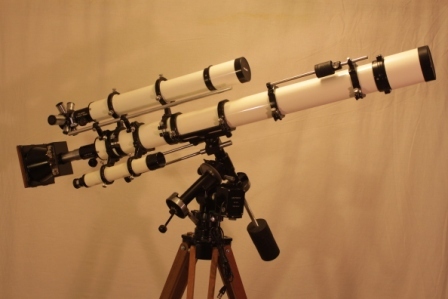 This entry was posted in Unitron Telescope, Unitron Weight Drive and tagged Telescope Clock Drive, Telescope Weight Driven Clock Drive, Unitron 145C, Unitron 160, Unitron Clock Drive, Unitron Telescope, vernier setting circles on January 8, 2013 by DaveTrott.